With the wonderful help from Josh Leng, the new Citizen Journalist coordinator at WKTV, we have updated the local media directory for the beginning of 2013. Having the contact information is important for local organizers, community groups and grassroots activists, but having the information is just the first step. It is important to be strategic in how you interact with the local news media. 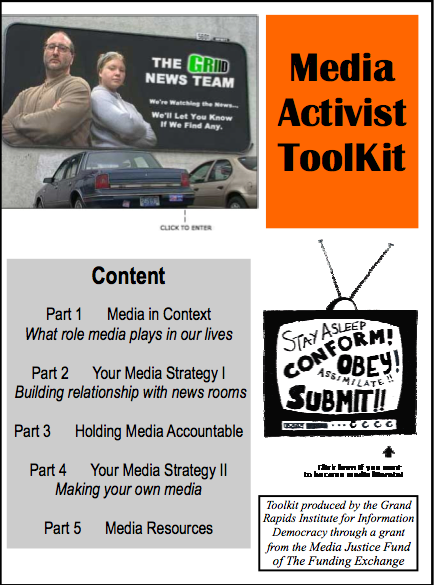 Check out our Media Activist ToolKit to get tips and ideas about how to important it is to develop a media strategy for your work. Also, if your organization or community-based group is look to develop a media strategy or need training on how to deal with the media, GRIID offers workshops on those topics. Contact Jeff Smith jsmith@griid.org if you are interested.